What started as a little Twitter screenwriting chat on Sunday evenings has turned into an internet phenomenon…. okay, maybe just a big screenwriter party of learning. Script Magazine mentions #scriptchat in the November/December 2010 issue! Thanks to Joshua Stecker, West Coast Editor and wonderful supporter of scriptchat, we appear on the page alongside other recommended websites for screenwriters. 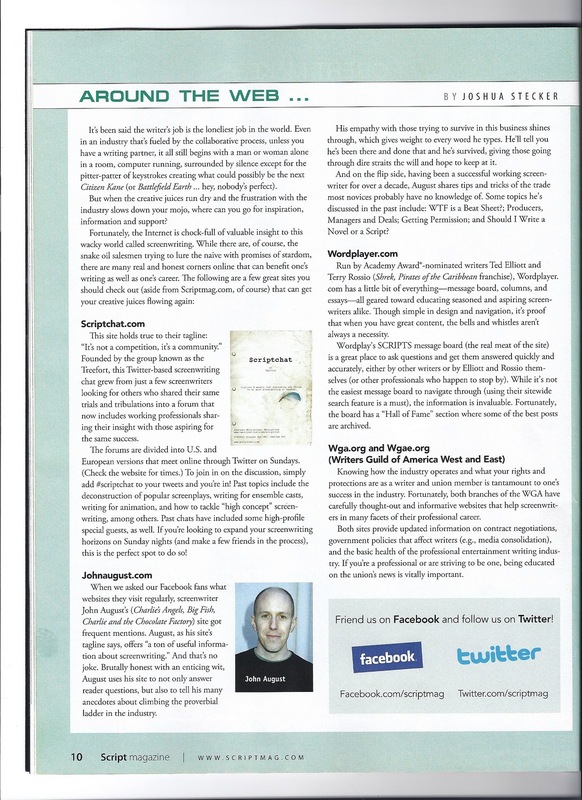 We even share the page with John August! The smiley stickers are plastered all over the scriptchat #treefort! Long live the generous screenwriting community, our treefort team… and tequila! This entry was posted in Blog, Scriptchat, Social Media and tagged scriptchat, social media, twitter, twitter chat by Jeanne Veillette Bowerman. Bookmark the permalink.